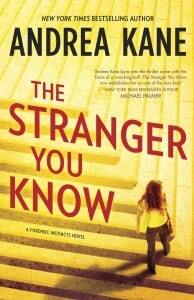 The Stranger You Know by Andrea Kane is the third book in the Forensic Instincts series. The book is billed as a standalone novel, but I will venture deeper into that a bit later. Casey Woods is still hunted by the murder of her best friend, Holly. Holly was brutally raped and murdered and her killer was never found. Casey, however, becomes a bit hopeful about possibly bringing her best friend’s murderer to justice, when she is approached to solve a case, which sounds quite similar to Holly’s. Casey and her Forensic Instincts team are asked by a dying father to solve the disappearance of his beloved daughter, who disappeared some 15 years ago—the same period of Holly’s murder. It could simply be a coincidence, but Casey instincts tell her otherwise. As Casey and her team delve deeper into the case, they discover answers which they were not prepared to find. And Casey may just be closer to this case than she ever imagined, especially when the murders suddenly pick up again. Each girl murdered has something in common with Casey, long red hair and a petite frame. The killer is sending a message to Casey, and if the Forensic Instincts team fails to find the serial killer in time, Casey is bound to be his next victim. The Stranger You Know moves at a steady pace. Methodically bringing readers into the world of the Forensic Instincts team. They are deliberate and efficient as they delve into the case. Each character adding a significant patch to the investigation. Kane’s team of characters have a believable working chemistry. Their interactions are not forced. It is believable the way in which there is conflict at times in regards to how to move forward and regarding Casey’s emotions. Casey is, expectedly, headstrong throughout the case. Her determination at all costs, is a believable trait. Especially given her ties to the cases at hand. I also appreciated being able to get into the mind of the man behind the serial killings. His character offers readers a tour into the thought process of a madman. It is both disturbing and intriguing, thus, masterfully done. As mentioned earlier, The Stranger You Know is the third book in the series, however it is regarded as a standalone. I have not had the opportunity to read the first two books, and I somewhat regret not doing so. Certainly the book was well written and enjoyable. However, due to the fact that I did not read the previous books, I failed to connect with the romantic situations in the book. It was difficult for me to root for the relationships between the characters because so much was going on within the case, that whenever those romantically involved in the book had scenes, it somewhat felt forced and unnecessary. I was more interested in the main issue at hand—the case. Therefore, the Casey and Hutch and Ryan and Claire pairings were incapable of drawing me in. Despite that small gripe. What I enjoyed most about The Stranger You Know were the twists and turns intricately woven so beautifully, that I was hesitant to put the book down. It made me want more, and more is always a good thing when reading. Kane displays a veteran writer’s ability to make the words on the page become more than just words, they become an illustration. A gripping read, filled with the necessary twists and turns, The Stranger You Know is a must read for your Mystery/Crime library. Hi would love to read this book. Thanks for the review. I would love to win this one looks spooky!